More than a half century after Jackson Pollock rocked the art world, his drip canvases are just as powerful as when the paint first dried. Although iconic, Jack the Dripper still unsettles the aesthetically weak of heart and confronts every artist who wants to make his or her mark. Abandoning the easel and applying house paint with a repertoire of gestures, this American colossus wrenched modern art away from tradition, making Pablo Picasso seem like a classicist in contrast. Immune to ridicule or appropriation, Pollock’s subversion has extended well beyond the life span of other revolutionary art. While Andy Warhol is readily mimicked and tamed, Jackson Pollock holds mysteries that remain unexplained — even by subsequent discoveries in fluid dynamics or fractal geometry. Quite simply, he gets to people. Perhaps it was fate. De Gloire’s father was a house painter and his mother owned a paint and wallpaper store. As a teenager, he worked with his father and acquired a professional understanding of house paints, a product that continues to be greatly improved since Pollock’s day. 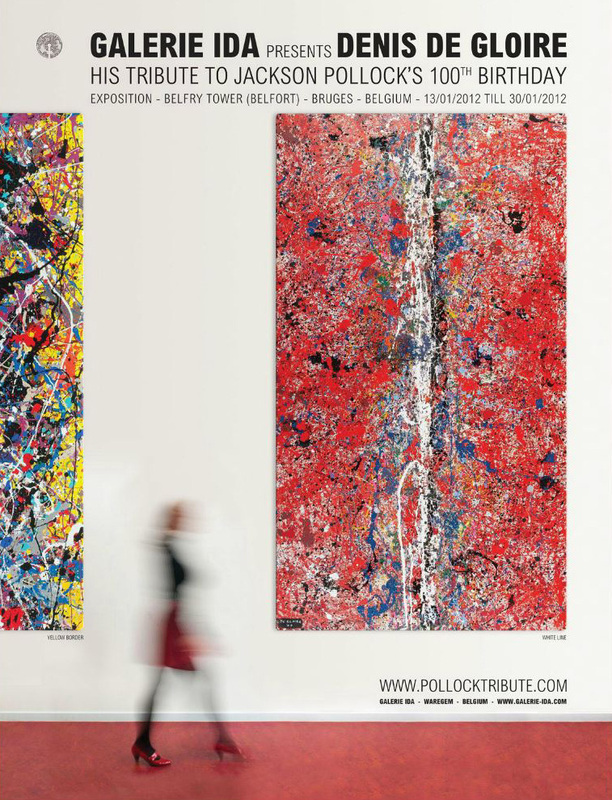 The release in Pollock’s art came from the fusion of line and color, a long-established duality in the history of art. De Gloire’s explosions are the result of his pushing the limits of pigments as they are laid down in ever-increasing convergences. 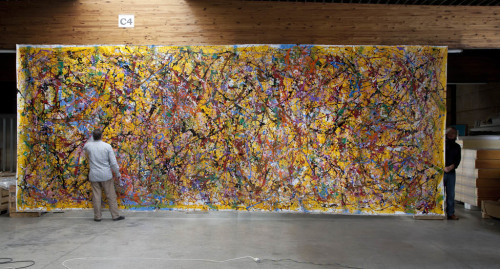 Whereas Pollock entered into a raw canvas, de Gloire works on prepared grounds, which interact with his high-quality, double-pigmented paints. A combination of fine-art pigments and hundreds of cans of exceptional house paints, his dazzling palette is a trade secret, but the range of his color choices and finishes wildly exceed Pollock’s. Matching the medium to the moment, de Gloire introduces new generations to the freshness of drip painting. If de Gloire is Pollock reincarnated, he certainly didn’t bring existential angst into this life. Imbued with vitality, he finds joy in painting and likens his process to playing like a naughty child or approaching like an aroused yet tender lover. The former boxer and boxing promoter describes his canvases as an arena in which you have to act: “It is a real fight with the materials. I’m destroying mistake after mistake until it’s there.” Excluding all distraction, he works over time and with time in a sequence of intricate “passages” composed of “patterns, regularities, and contrasts” moving toward an uneasy balance. From out of Waregem and not Wyoming, he creates crescendos of color of Baroque proportion — as much heir to Rubens as to Pollock. Engorged with an excess of sumptuous drips, splashes, and splatters, de Gloire’s monumental paintings teem with an orgiastic life force at once sacred and profane.